We don't write that much about make up and beauty products on the blog. The wonderful Anna K wrote a fabulous post about her favourite make up and I wrote about an all too short subscription to Glossybox that my brother bought for me last Christmas, but that's been about it. I adore make up and beauty products but over the last year have been trying to be very restrained and not spend money on beauty treats for the sake of it. One thing I have never given up is my Liz Earle habit! I figure I'm *allowed* to spend a bit of money on some decent skincare for my face. I discovered the brand through QVC when I still lived down south, so maybe 8 or so years ago, and have loved it ever since. I felt the need to tell you about the brand as their customer service is quite simply exceptional. I ordered a few products last week, they do a cleanse, tone and moisturise offer each month where you get an additional free full size product and free postage, along with the usual sample size freebie that they send with every order. Their sample size freebies are simply amazing for holidays and trying products in the range that you haven't thought of ordering before. They had included two full size face moisturisers for free to thank me for being a customer! That's nearly £40 worth of free products when my total order was only for that amount. And it's not the first time they've sent me a little gift, it's probably the fourth or fifth. Last year it was a set of three 100ml shower gels, perfect for taking on weekends away or on flights. I don't have experience of any other brand sending such generous thank you gifts and it certainly puts a smile on my face :) Does anyone have a similar experience with another brand to share? 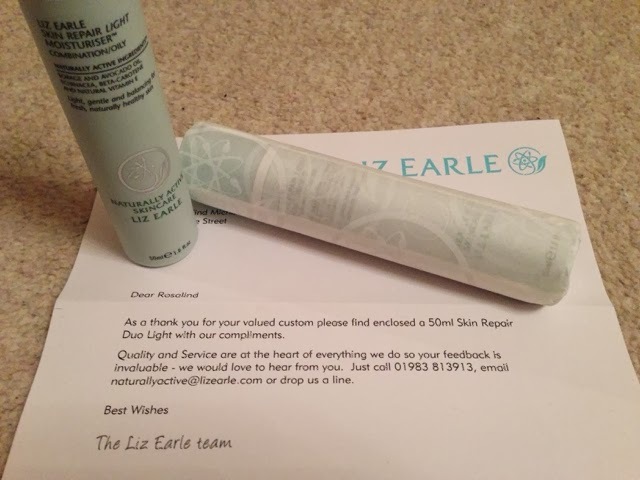 I love Liz Earle. My auntie got me and my mum hooked years ago. I'm thinking I should start ordering online though (I usually buy it in John Lewis these days) free gifts are always fun!